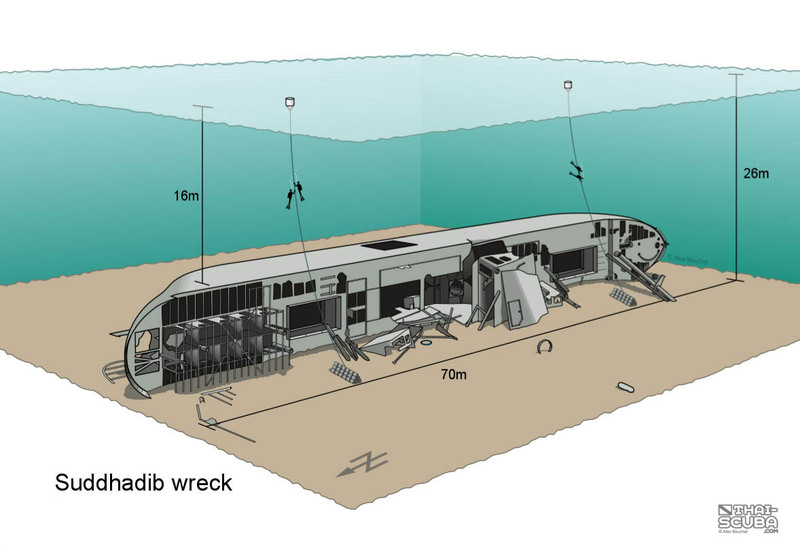 It was during my Dive Master course in 2004 that I embarked on the idea to create a dive site map of the Suddhadib wreck (aka the “Hardeep Wreck”) in actual scale. 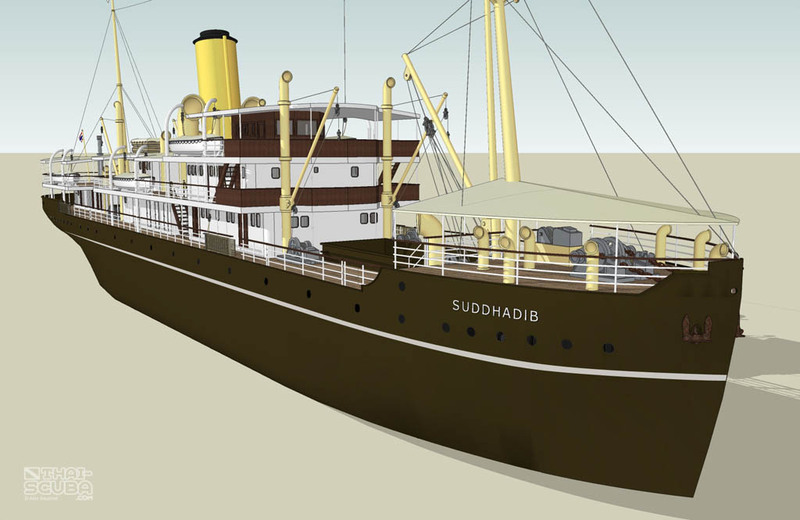 No one had ever seen the wreck in its entirety and with an average visibility of 6-8 meters the Suddhadib can only be grasped piece by piece while on a dive. 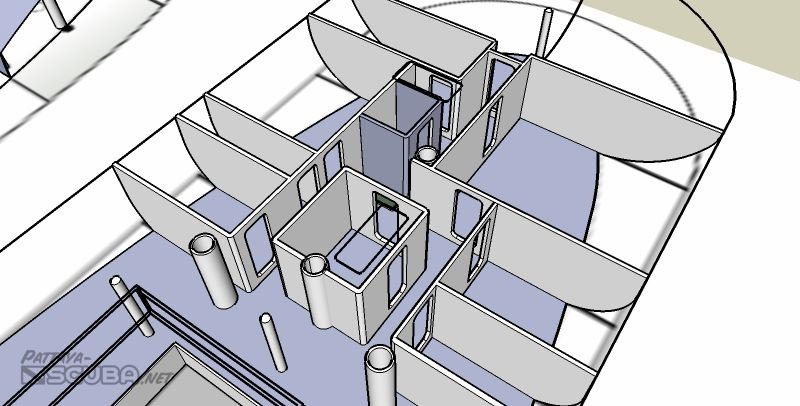 What had started as a simple mapping project has since become an artistic journey that span off in various other directions. 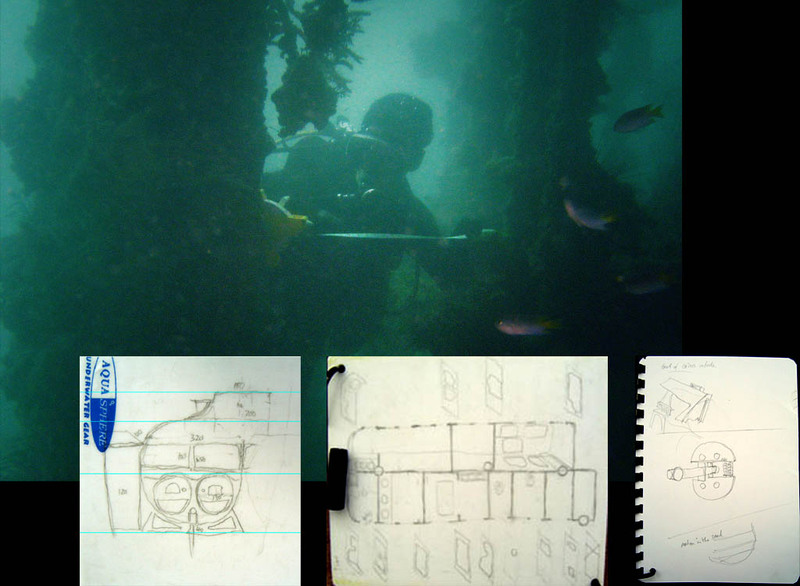 Even equipped with a digital camera, taking photographs of the wreck and stitching them together simply was not an option. 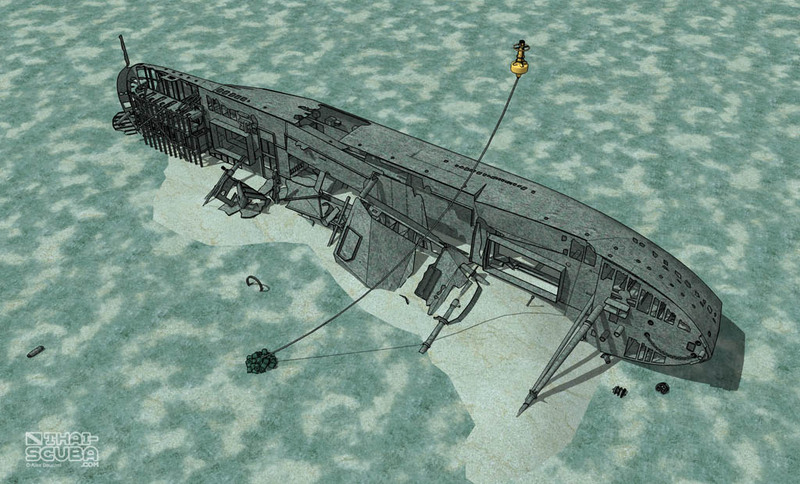 Overall, the wreck is too long and an even camera angle can not be ensured. 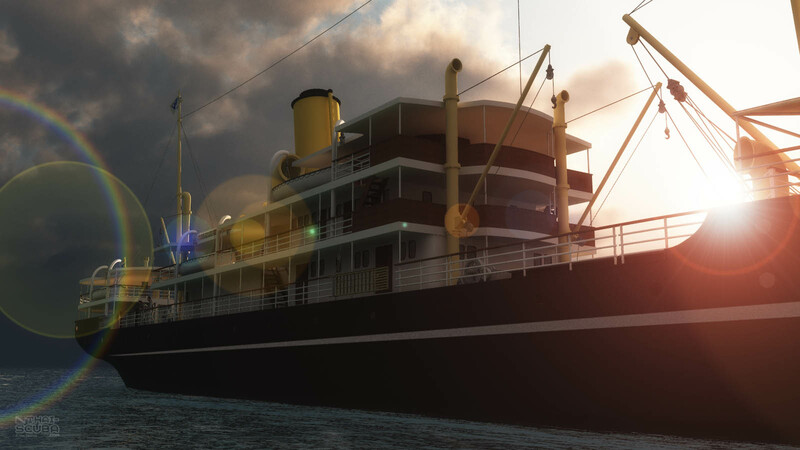 Visibility changes every day, so a consistency of photographic results is never guaranteed. 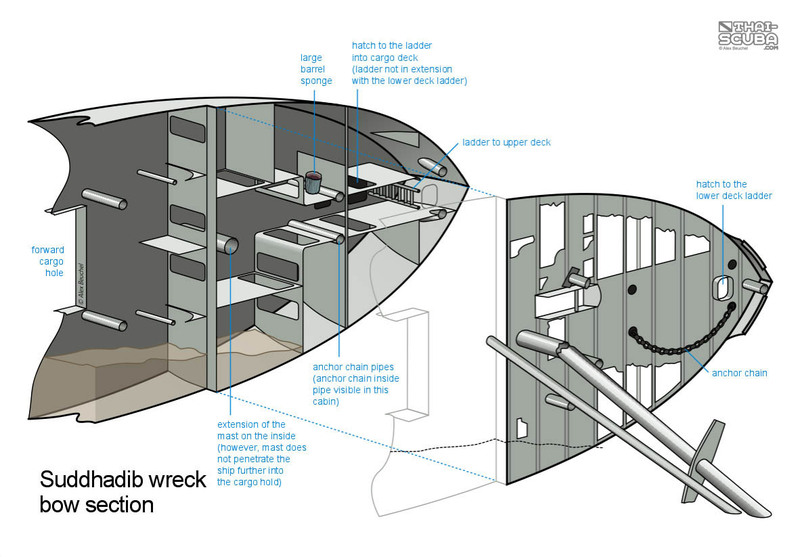 Photographs are good for capturing details, but even equipped with a wide angle lens, the visibility at the dive site will not allow a diver to go back far enough to really get a sizeable portion of the wreck in one shot. 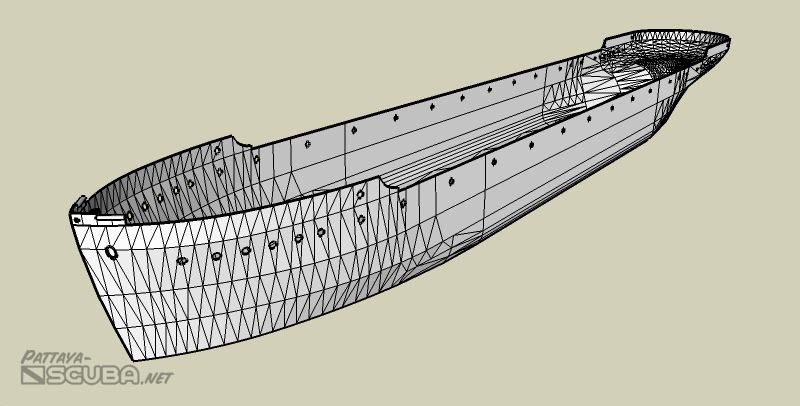 Piece by piece the individual measurements contributed to the creation of 2D drafts of each deck of the wreck in a 1:100 scale in a vector software. 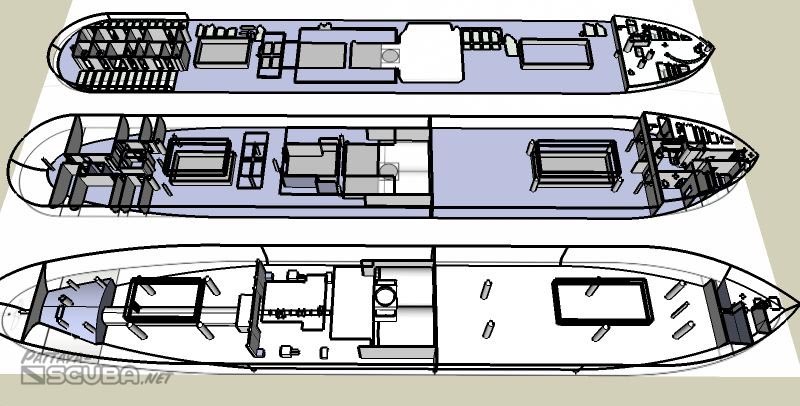 Aligning the different ends of the cabin bulkheads produced the outlines, shapes and curvature of the hull in each respective elevation while height information of the lower decks also allowed for a first preview of the upright hull. 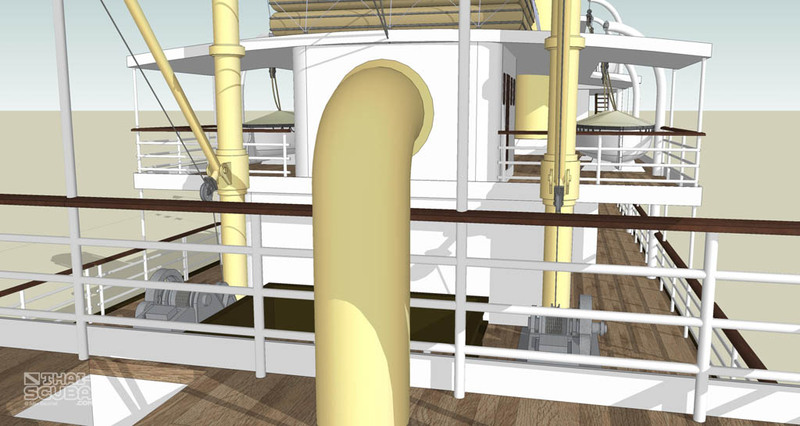 Although “3D” in appearance, these computer illustrations are not 3D files as they do not allow for rotation to another camera angle. 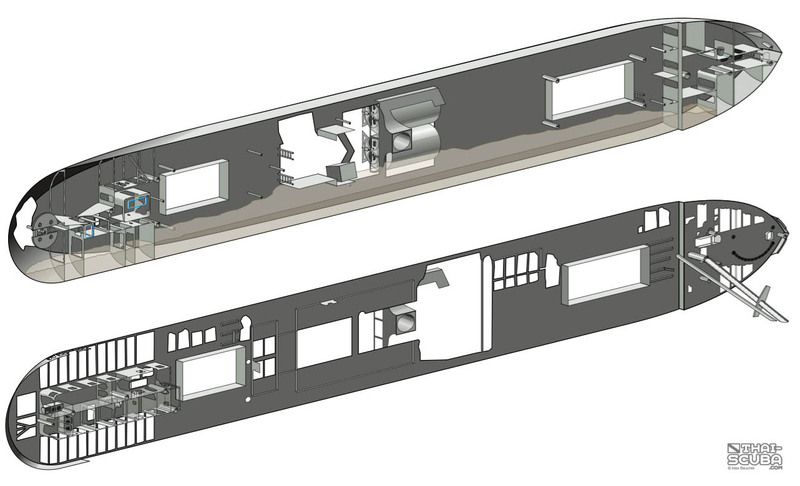 They are a simply a skewed perspective of the 2D files in a vector software. 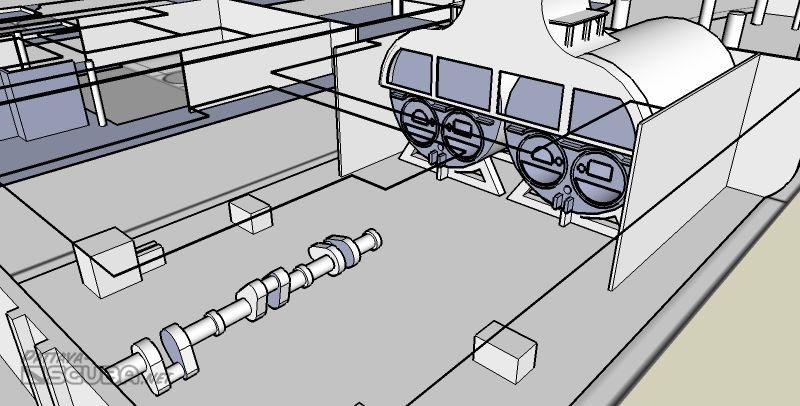 Details to arrive at the final look are added ‘by hand’. 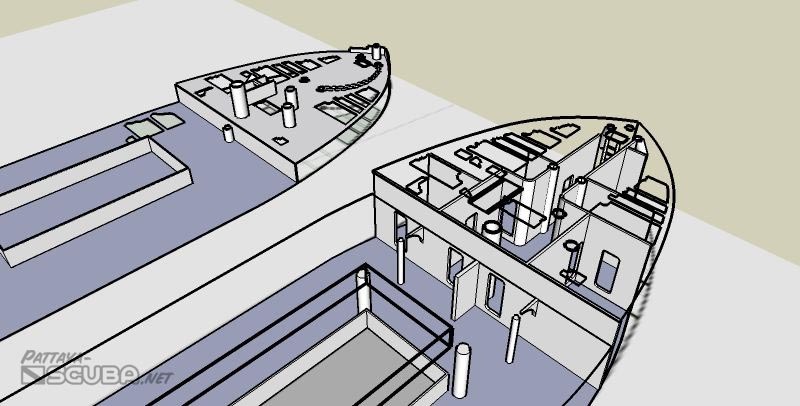 Although I have since progressed past this stage in terms of building the wreck and ship in a 3D software, I still consider this set of 2D illustrations excellent maps for planning a dive or briefing the wreck to a new diver because of their simplicity and clean graphic appearance. 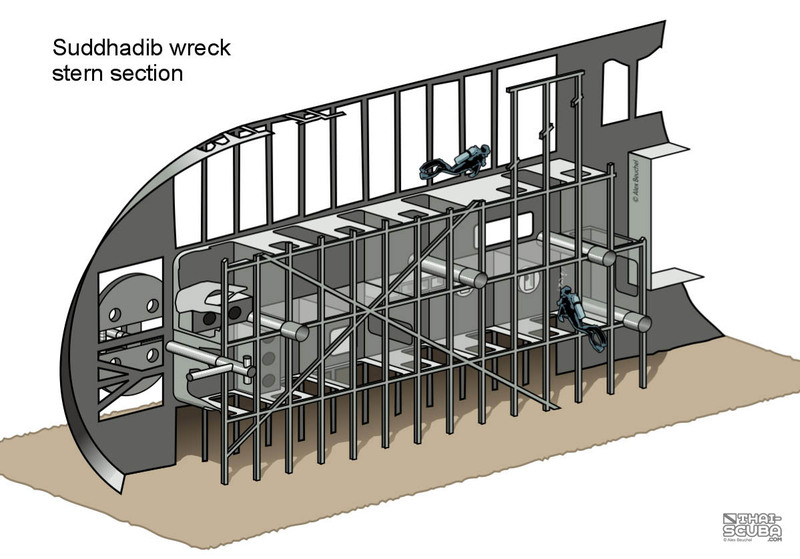 This set of visuals depicts the condition of the wreck in 2008. 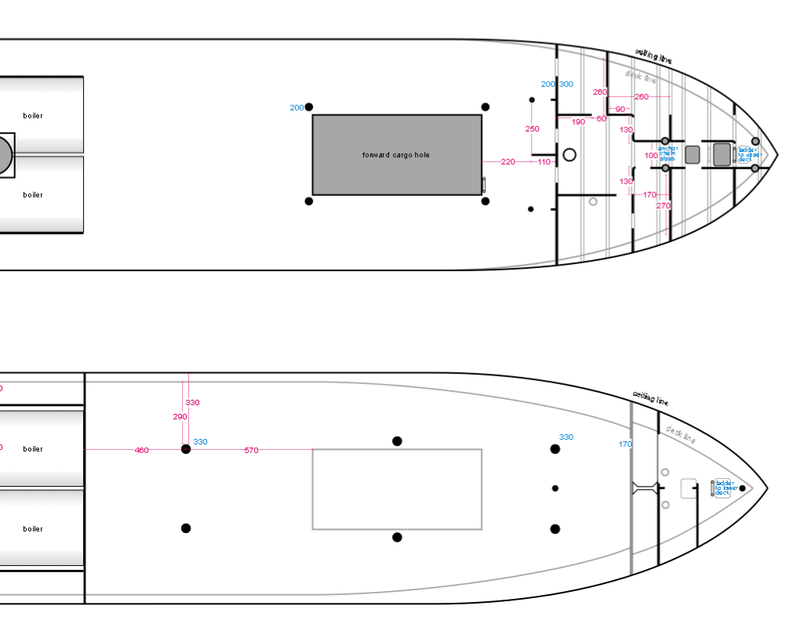 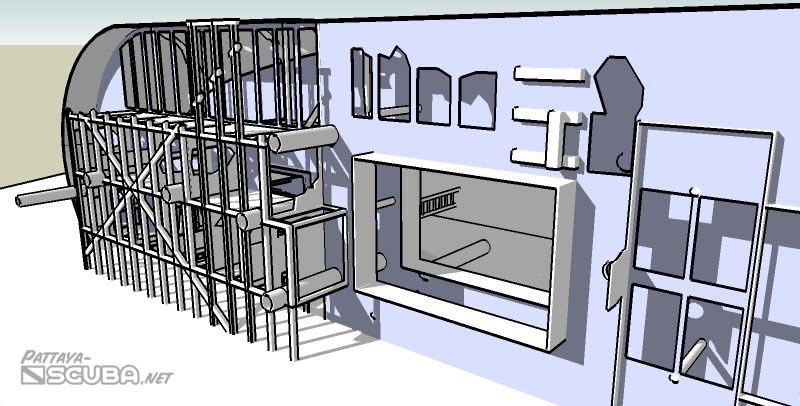 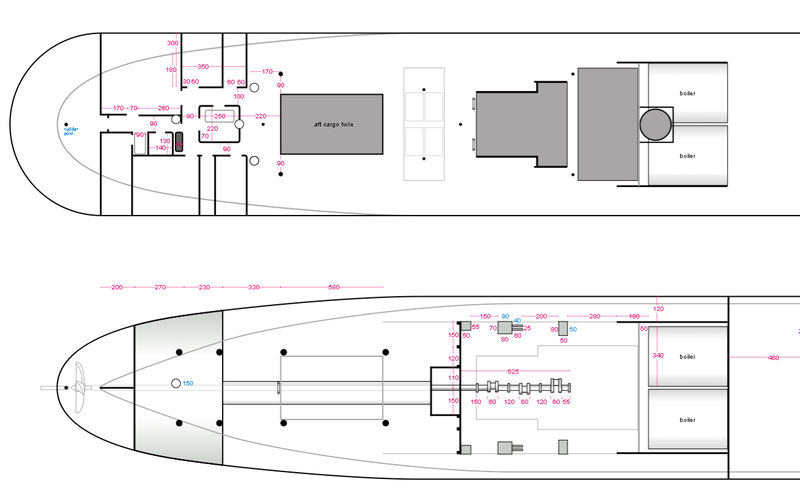 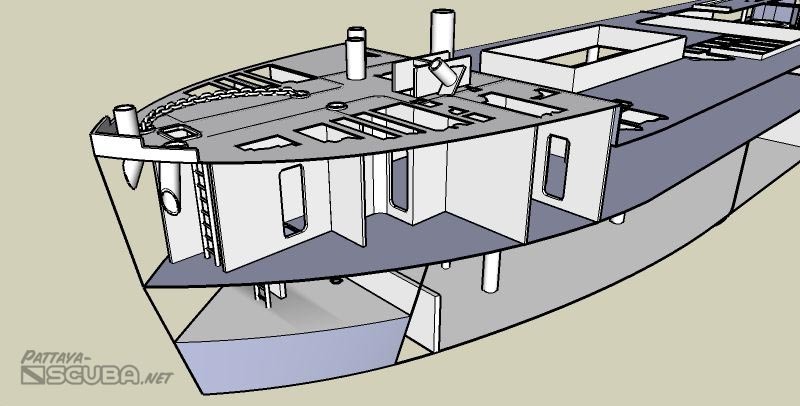 With the 2D deck plan data in hand I used them as a starting point for re-creating each deck of the wreck in SketchUp Pro, a 3D software from Google. 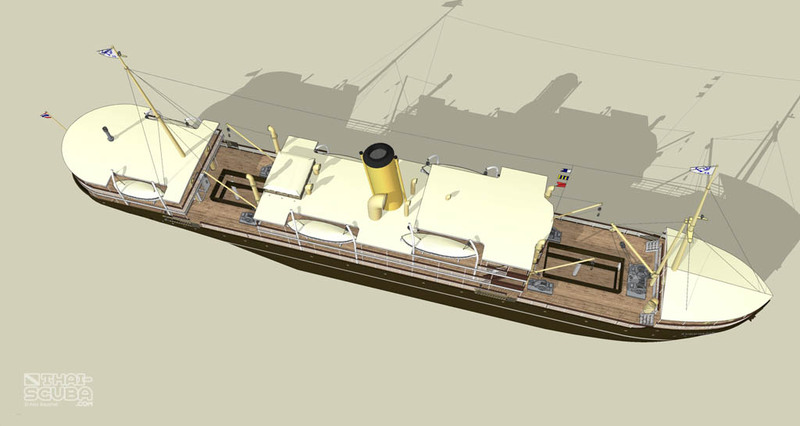 Since this was intended to be a model of the wreck (as opposed to the model of the ship before her sinking), all details of damage were included in the files. 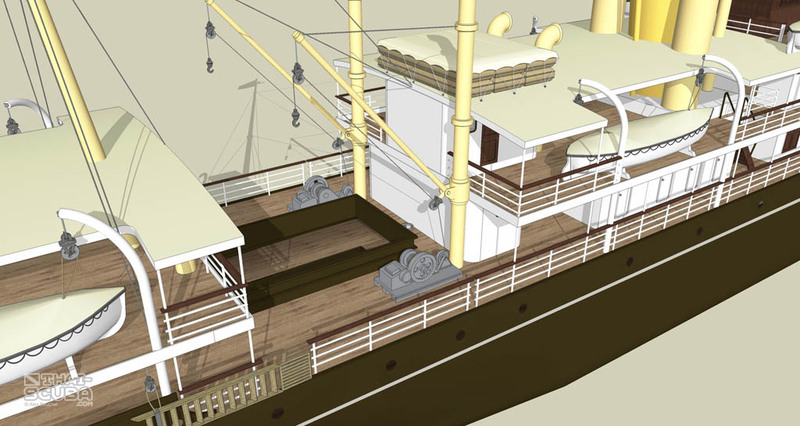 Each deck was re-traced and lifted in elevation to the proper height. 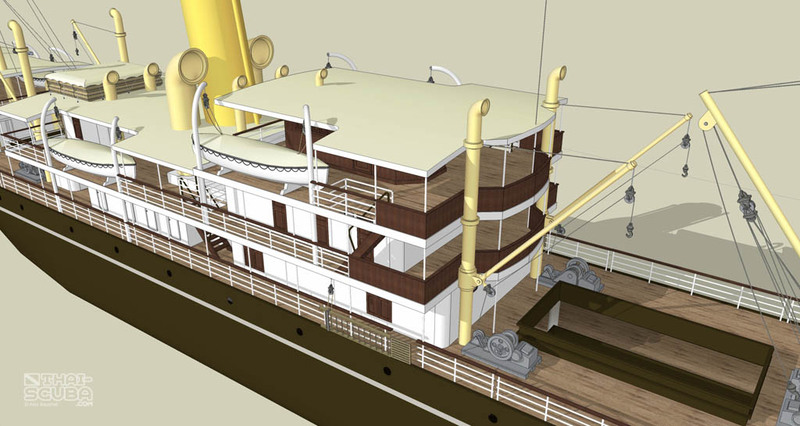 Once each deck was complete I could stack them on top of one another to observe the parts that line up in height. 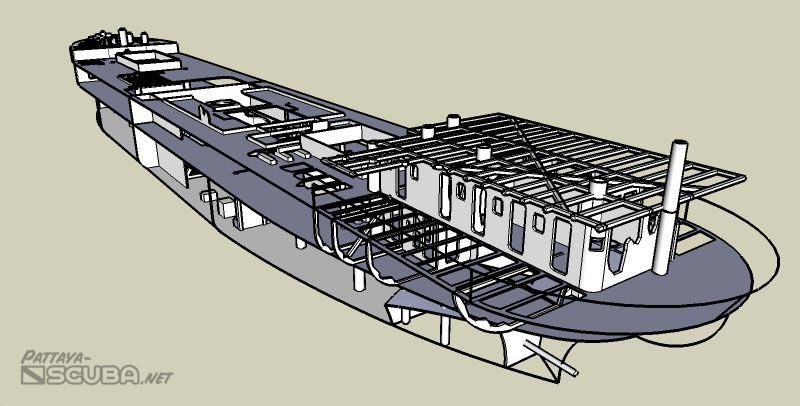 The hull lines of each deck were then joined to form the shape of the hull. 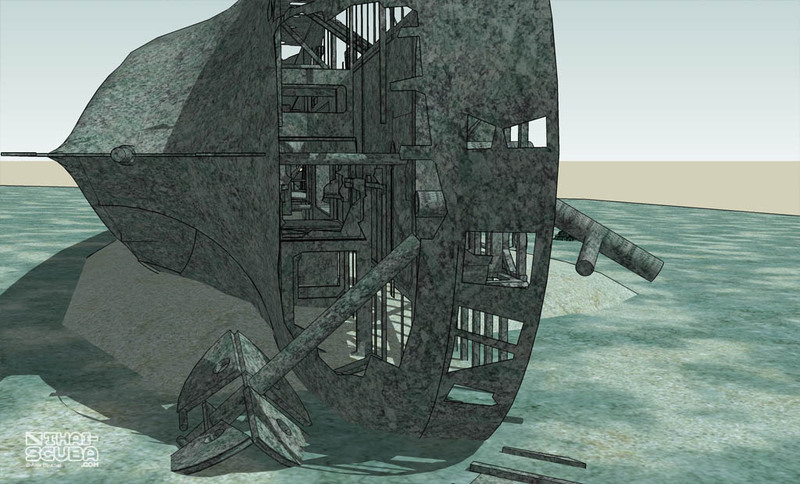 Once all elements were joined, the wreck was given its starboard side rotation and was placed on a sloped plane. 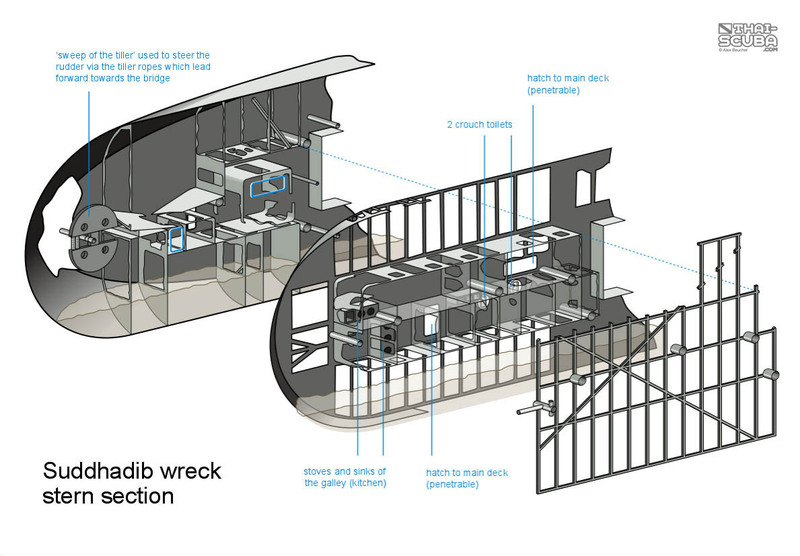 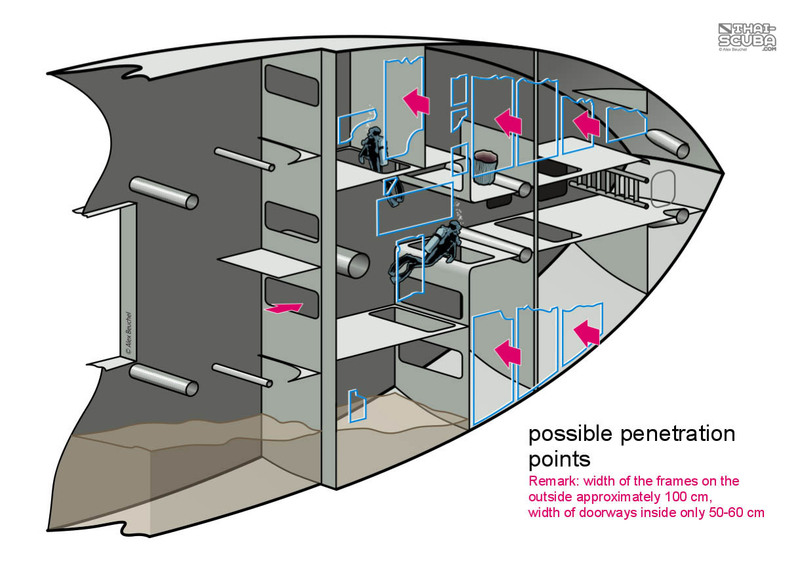 The structures of the upper cabins needed to be surveyed separately as well as the shape and elevation of the sediment piles around the wreck. 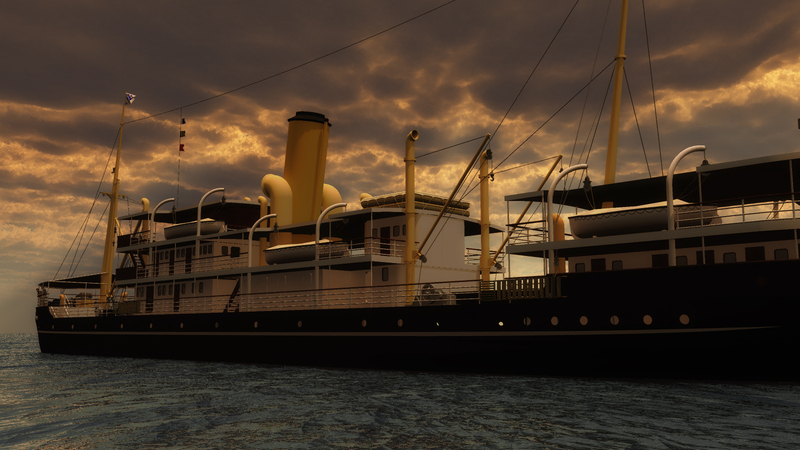 Here a small selection of renders of the Suddhadib 3D model. 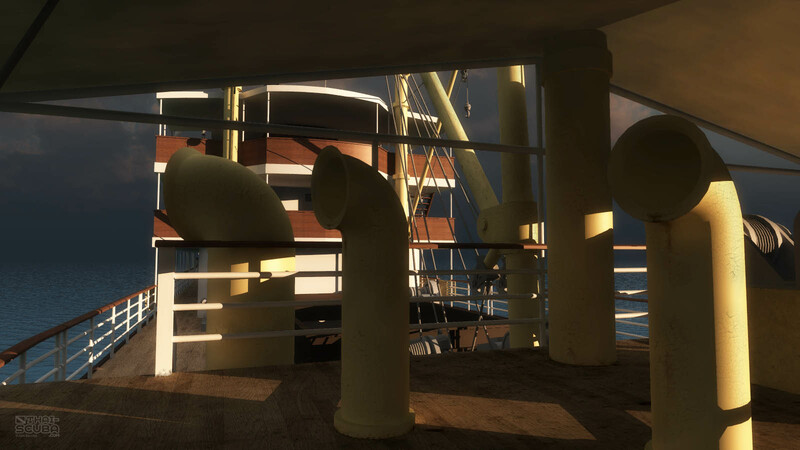 Make sure to visit the full gallery page with detailed captions to various visuals! 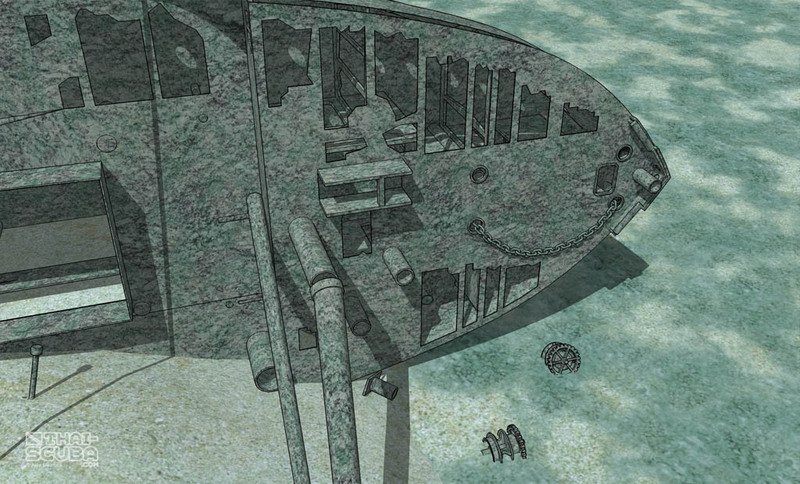 With the 3D model of the wreck in hand which was mostly based on measurements taken right off the wreck underwater, I was able to recreate the upper decks of the undamaged ship after our friend Peter Walker’s historic research on the Suddhadib produced 2 beautiful historic photographs of the ship. 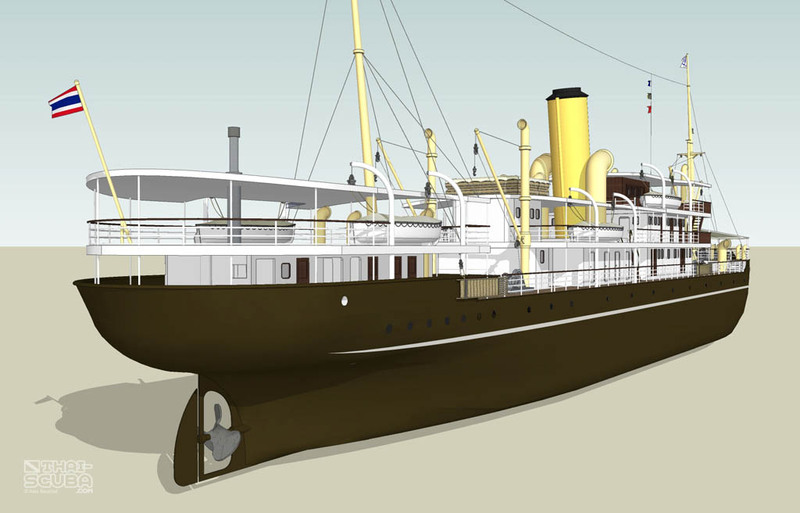 Beyond shedding light on the ships history and her sinking, Peter’s diligent research not only produced the photographs but also a spec sheet of the ship with color information of individual details and materials. 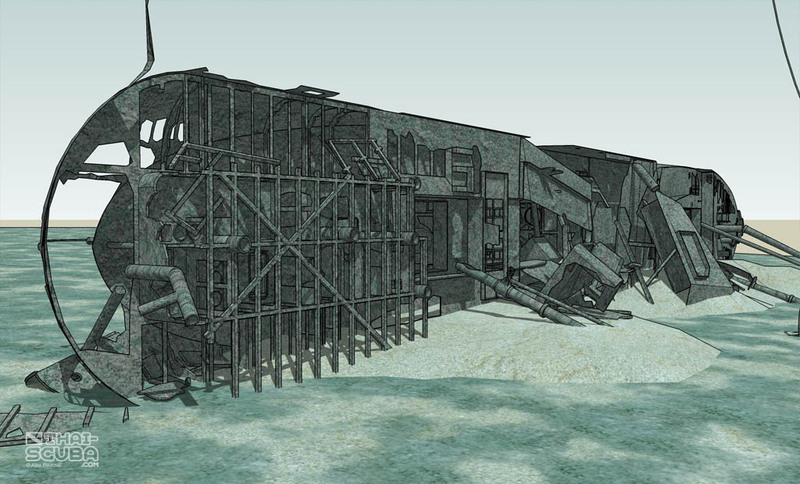 This info was followed closely in applying colors and textures of the 3D model. 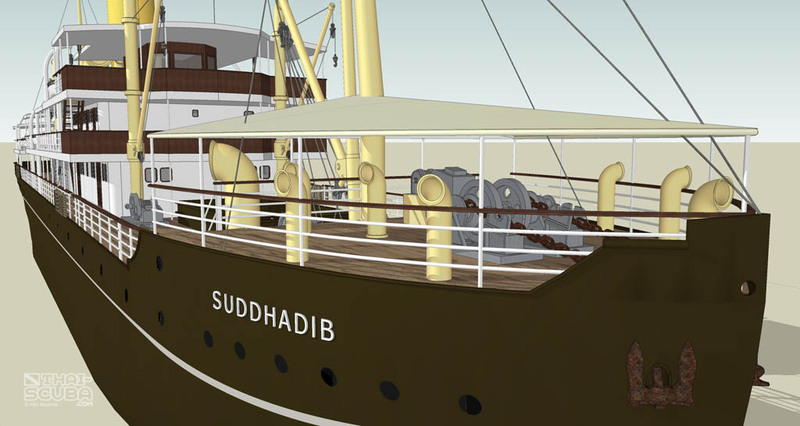 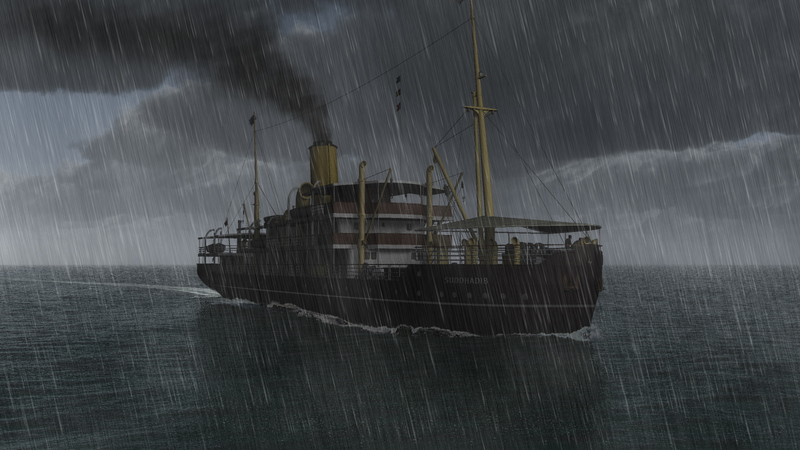 The reconstructed Suddhadib 3D ship model was then exported to another software for the creation of beautiful, life-like renders with various weather conditions. 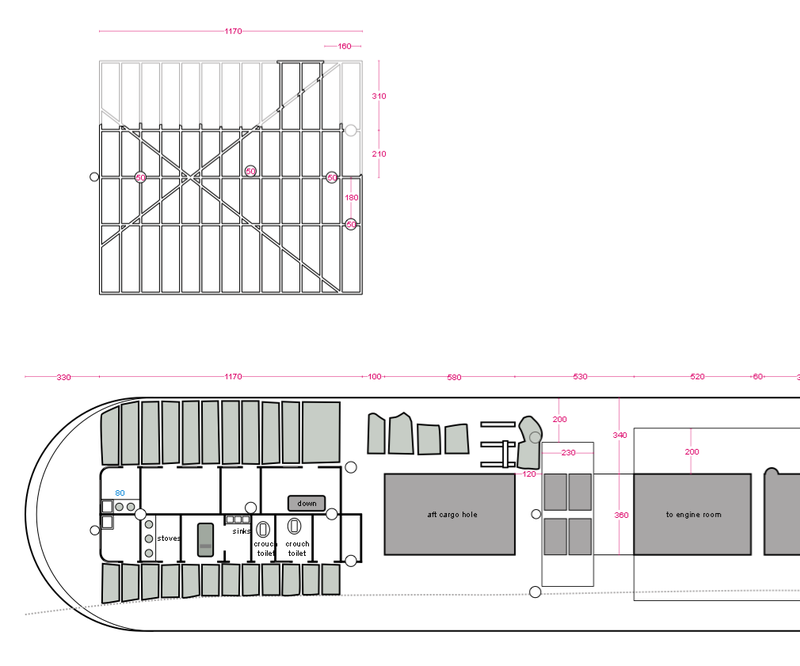 Click to view the full set on its separate page!